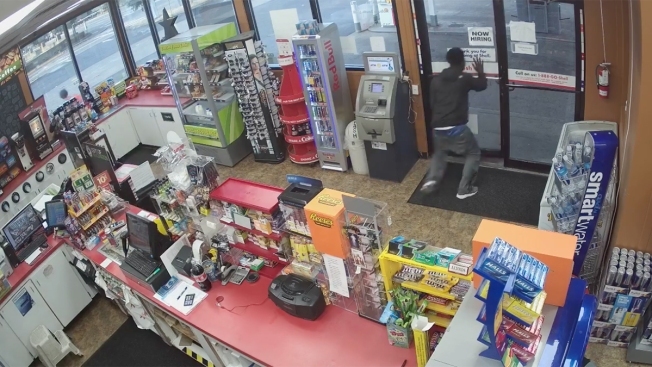 This screenshot taken from video provided by the Auburn Police Department shows a boy running out of an Auburn Shell gas station after the clerk fell unconscious on Saturday, Sept. 8, 2018. Two teens were caught on camera stealing cash and merchandise from a Washington state store clerk after he collapsed to the floor and lay unconscious, police said. The incident happened at a Shell gas station in Auburn Saturday evening. One boy took a pepperoni stick from the counter and began to eat it, Auburn police said in a statement. He then grabbed a second stick and gave it to the other boy. Police said the clerk appeared to charge an adult man in line before the boys for the food. An argument broke out, and one of the boys gave a dollar to the clerk. Surveillance video shows the clerk walk to the front of the store to talk to the boys. When he turns back toward the counter, he appears to suffer a medical emergency and falls to the floor. One boy takes the dollar from the clerk, and the adult man leaves the store. None of the three people called for help, police said, adding that the clerk was in critical condition as of Monday. The boys then left and entered the store several times to steal products and all the cash from the register, police said. Video shows the boys climbing over the counter and running out of the store. Another person walked into the store about three minutes later and called 911 after seeing the clerk. Police later said that the two teens and the adult man were identified with the public's help. The adult man was cooperating with the investigation and authorities said they "are confident he was not actually associated with the two teenagers in the video and does not know them." Officials said Wednesday they have not spoken with the two teens and are currently looking for them.